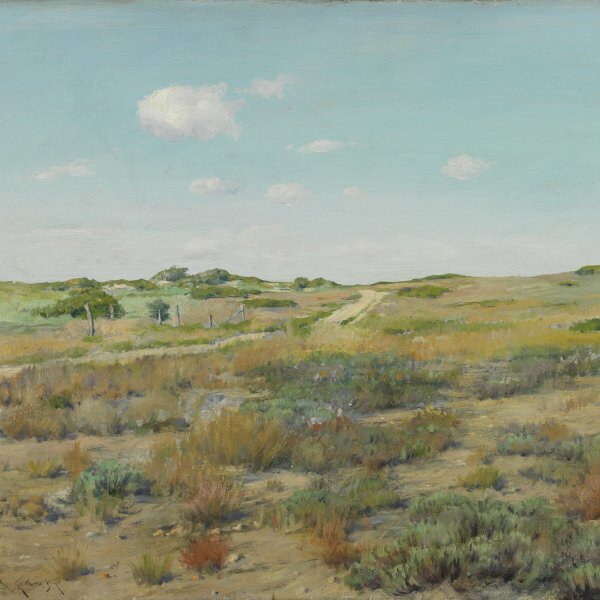 During the 1880s Chase turned his attention to the plein-air landscape. For several years he made small, quickly-executed studies in Prospect Park, Brooklyn; and upon moving to New York at the end of the decade, he began to paint Central Park. 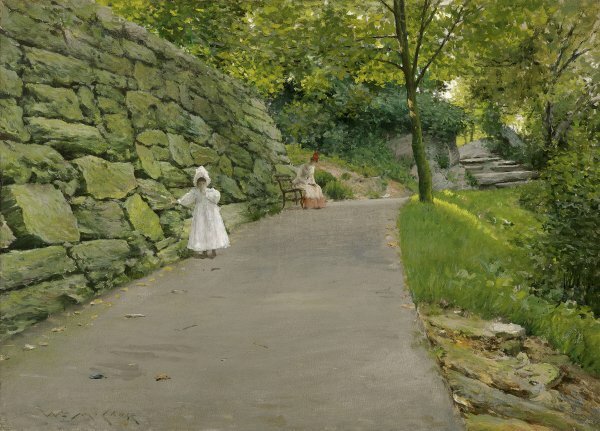 In the Park is the picture, A By-Path, described in an 1891 article on Chase's Central Park landscapes as including "one of those sections of rough rock-work which give character to many nooks and corners of the Park at the same time that they serve a useful end. Here, again, the ever present nurse and child recall the purposes for which Central Park and many another park of New York have been established." The "rough rock-work" noted by the author was the remaining foundation wall of Mount Saint Vincent, a convent for the Sisters of Charity situated in the northeast corner of the Park near 105th Street and Fifth Avenue. In 1847 the Roman Catholic Order purchased the area that was originally the site of McGown's Tavern built in the 1750s. The convent, which included a boarding school for several hundred female students, was incorporated as park land in 1859 under Olmsted and Vaux's development of Central Park. The building served briefly as a military hospital during the Civil War, and then the old convent building reverted to a tavern that catered to the wealthy carriage trade. Mount Saint Vincent burned to the ground in 1881, but was soon rebuilt as another saloon, now named the McGown's Pass Tavern. It was torn down in 1917 by the New York reform mayor, John Purroy Mitchel, who desired to maintain the natural qualities of the park. The foundation wall, but not the pathway, still remains today. 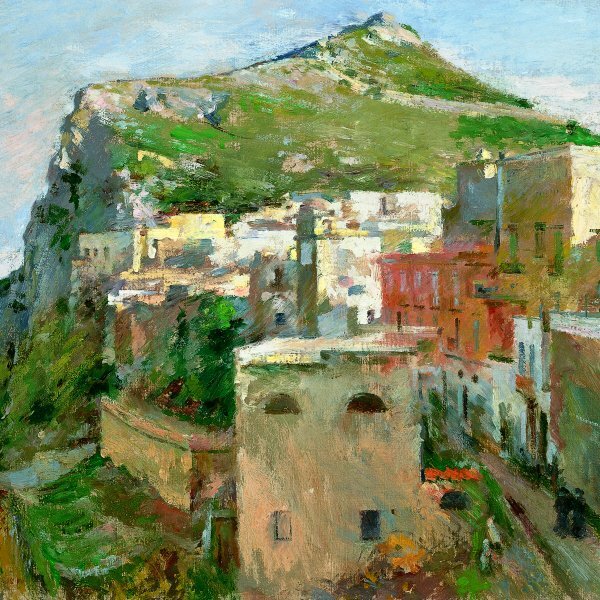 Like many of the American Impressionists, Chase often used a converging pathway to lead into his composition. The foreground of In the Park is left empty, with the figures placed upstage, their white and pink-and-red dresses acting as contrasts to the green tonality of the landscape. The artist used his wife and their first child, Alice Dieudonnée, known as Cosy, who was around two and a half at the time, as models. The gesture of the woman on the bench, leaning forward with her head slightly turned toward the viewer, was previously used by Chase in A City Park, 1887, The Art Institute of Chicago, which shows Tompkins Park in Brooklyn. Chase was one of the first artists to use the parks created by Frederick Law Olmsted and Calvert Vaux in the 1860s as subjects for his paintings. Man-made urban parks were a popular motif for the French modernists, but for Chase's contemporaries to paint "the smug symmetries of a public park landscape" was a radical departure from the norms of landscape painting. The critic Charles De Kay observed that Chase "has hit upon a discovery which is yet to be made by a very great proportion of the inhabitants of New York. He has discovered Central Park. Not that most New York people do not know there is such a place, and are not more or less proud of it, but comparatively few of them ever go into it, and when they do go, they rarely see anything." Chase's small paintings of the parks were considered by Kenyon Cox to be "veritable little jewels, " evidence that it is not subjects that were lacking in America, but eyes to see them. "Let no artist again complain of lack of material, " he wrote in 1889, "when such things as these are to be seen at his very door, and let the public cease complaining of the un-American quality of American art." The park landscape offered a compromise between the wilderness and the city: "Indeed, why should not these exquisite scenes of Central Park, " De Kay argued, "find their way from the artist's easel to the walls of citizens as easily as pictures of Niagara, or views taken in Lutetia Parisiorium." However, it was the next generation of painters, those associated with Robert Henri, who enthusiastically celebrated the urban park as part of the American scene.